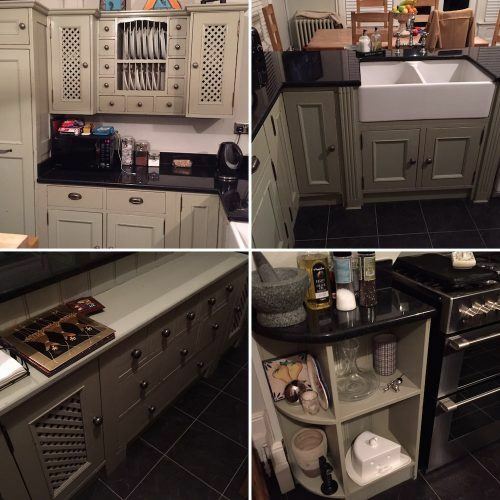 Emma Brown, Traditional Painter for Kent, was asked to refurbish a painted wooden kitchen. She designed a breakfast bar, modified cabinets and hand painted the kitchen. To add to the challenge, the previous kitchen painter had painted straight over wax with conventional furniture paints. Read all about the spectacular and very efficient turnaround. My biggest concern is that the new finish will be tough, as the existing one chipped within a matter of weeks! I promised my client that she had come to the right place and that with the correct preparation, procedure and products the paint finish would last for years. I could see from the photos she had sent me that the doors were indeed badly chipped and I had my suspicions as to why. I was also asked if I was able to do more than painting, as they wanted to refurbish their wooden kitchen, ie modify or add cabinets. 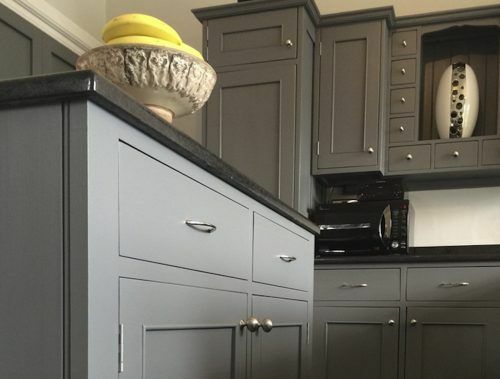 I said I definitely know a trustworthy and experienced cabinet maker, and if they were looking for ideas for finishing touches, I have plenty of experience with kitchen design, and used to work as a colour consultant for Fired Earth. 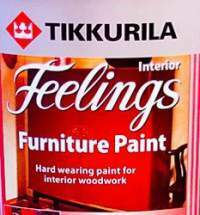 First things first, I needed to put the client’s mind at rest about why the current coat of paint was chipping off. It scraped off so easily! 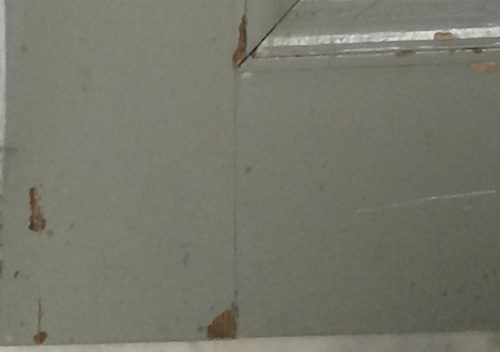 And as I thought, I could see that the previous painter had applied the conventional furniture paint straight over the original waxed pine cabinets, with little or no preparation. To ensure proper adhesion, everything would need to be taken back to the bare wood and thoroughly cleaned and sanded before painting could even start! It was painstaking work, but in general the paint was not adhering at all well, and I had the right tool for this job. Removing all the existing paint and old wax took a while, but it was so important and worth the time and effort. I then followed with my tried and tested procedure of using Zinsser Bin as a high adhesion primer and stain block, followed by a tinted undercoat and then three coats of eggshell. I usually use Mylands eggshell as it is an interior and exterior paint, lovely to apply and is very hard wearing. My client chose ‘Leadenhall’ from their Colours of London range. As well as a change of colour, we identified a few other areas we could work on to transform the kitchen into a more contemporary work- and living space. 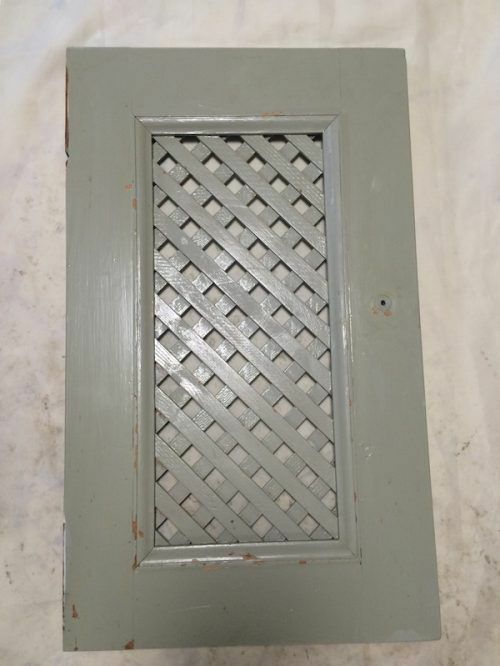 – The dated lattice work – as seen in the photo below – was replaced with solid wood paneling. – The plate rack was removed to transform the unused space into a striking display area. 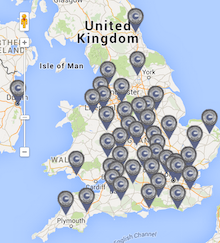 Can you design and install a new breakfast bar? Certainly. As part of this project to refurbish their pine kitchen, my client also wanted an island/breakfast bar to match the rest of the painted cabinets and kitchen area. And so, using a piece of granite she already had, I designed the island to her exact specifications. My father is a cabinet maker. We work well together. Once we had the design and measurements sorted, he was tasked with the construction. He also made new cabinet doors to cover two open shelves either side of the oven. Good design is all about the details, and we went into great detail to finish the transformation. – New chrome hinges replaced the old brass ones. 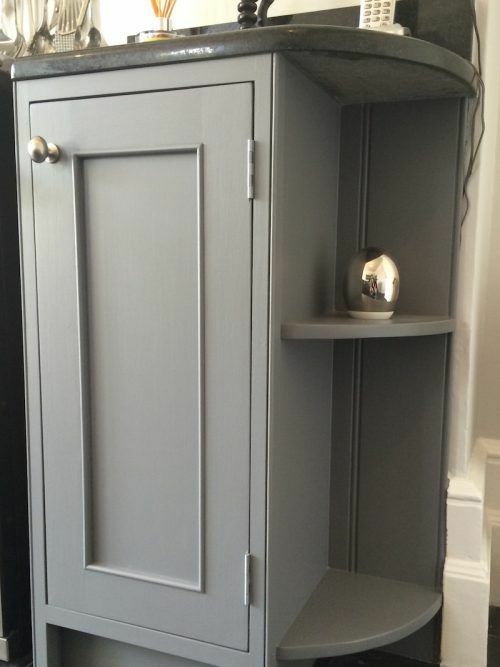 With matching new chrome knobs and handles the look really complimented the dark grey colour choice. – A sanded and re-oiled table . After – the results speak for themselves! 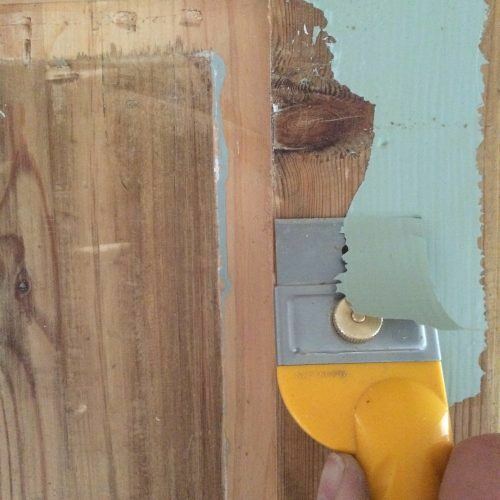 To refurbish a painted wooden kitchen ,especially one that has defective old paintwork, is no easy task to coordinate nor complete to the highest standards. 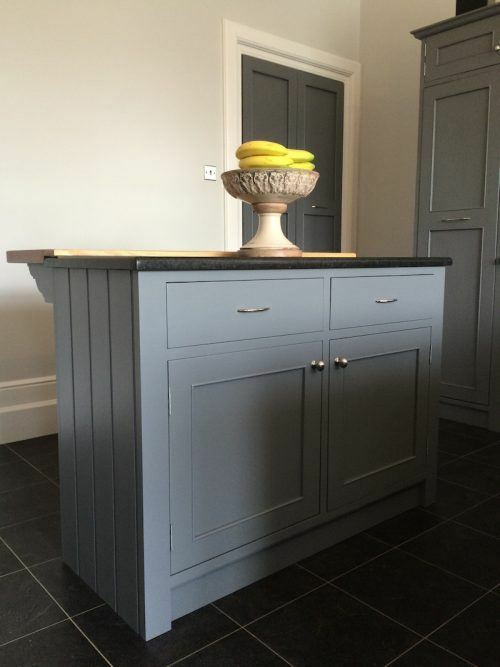 However, Emma has all the specialist painting and cabinet-making bases covered, and for the finishing touches, there is no better quality controller than a kitchen painter with a flair for design and an eye for detail. 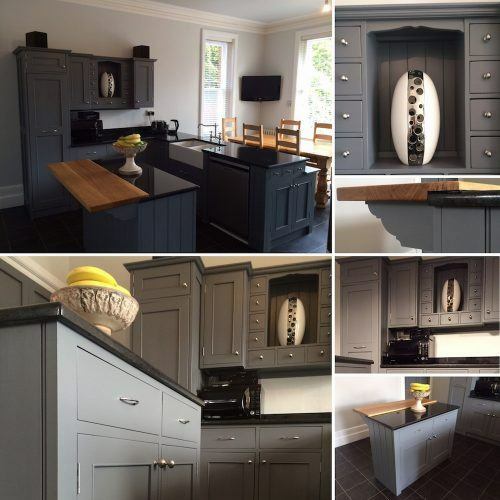 Get in touch today with Emma if you would like your wooden kitchen upgraded and remodeled into a stunning, contemporary new space for you and your family to enjoy for many years to come. More reviews of Emma’s work.